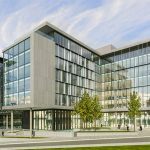 Alucraft Ltd. is proud to announce that they have secured another new façade contract with Collen Construction Ltd on the prestigious One South County office development in Sandyford. This HQ office building is LEED Gold targeted with its highly sustainable design by TOTP Architects. The multimillion euro contract includes the delivery of Schuco FWS 50 Capped and Schuco FW 50 SG curtain wall glazing with Polyester Powder Coated aluminium systems in a selection of RAL colours to all elevations and a significant element of roof glazing. Alucraft Ltd. will also deliver several large format insulated glass units, a large atrium with a sloped glass roof. The atrium vertical glass walls will be supported by a series of horizontal steel booms and stainless steel Macalloy rods. The development features 2.8 metre floor to ceiling height which will allow excellent natural light into the 5 floors of office accommodation using a combination of Guardian SN Super Neutral glass products. This will offer a number of benefits including maximising light transmission, minimising heat gain due to the solar coatings and offering U values in the region of 1.0 W / m²K. Alucraft Ltd. will design and manufacture all the glazing elements in their Cloverhill Industrial Estate facility with installation expected to commence on site in Q1, 2018. 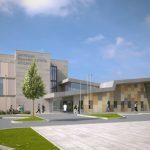 New National Rehabilitation Hospital Façade Contract For Alucraft Ltd.